It was a worn-out wooden tow barge when a storm claimed it in the middle of Lake Michigan during the late summer of 1927, but the Hennepin had once been a proud freighter that steamed the Great Lakes under its own power. Originally built in 1888 as the 208-foot-long steamer George H. Dyer, the ship was driven by an engine salvaged from the wrecked steamer William T. Graves after it was driven ashore near North Manitou Island. The Dyer served the Davidson Steamship Co. of Milwaukee until 1898, when it was sold to new owners and renamed the Hennepin. Three years later the vessel was nearly destroyed by a fire that started in an adjacent freight house while docked in the Blackwell Canal at buffalo. Before the fire was extinguished, the Hennepin’s upper works and most of its machinery was destroyed or severely damaged. The burned-out hull was sold to the Lake Shore Stone Company rebuilt for service as a stone and gravel carrier. 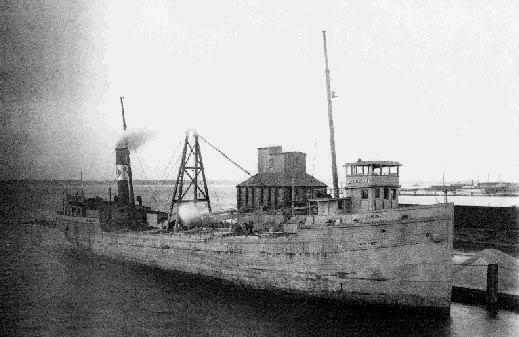 Some years later when the wooden hull was clearly deteriorating, the Hennepin was stripped of its superstructure and machinery and converted for use as a tow barge. She was then sold to Construction Materials Co. of Grand Haven in the early 1920s. 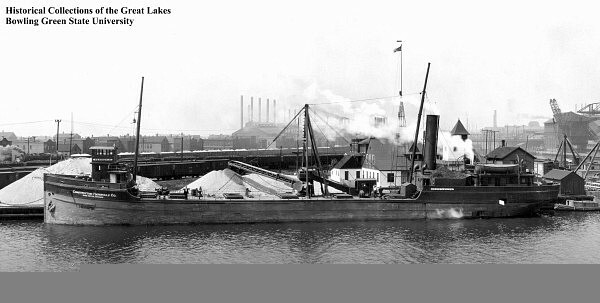 She was under tow behind the tug Lotus, returning with a cargo of gravel from Chicago bound for Grand Haven on Aug. 18, 1927, when a summer storm overcame the old vessel. After it sprang a leak, Captain Ole Hansen and his crew of 13 worked for four hours keeping it afloat before abandoning ship. They had time to get safely aboard the tug before the Hennepin sank in over 200 feet of water. “She died a hard death,” Hansen later said.